Over 55 million meetings held in the US every week. Check out these six tools that can help you facilitate those meetings a little easier. In America, 55 million meetings are conducted on a weekly basis, whereas the total number of meetings held annually in America surpasses well above a billion. That's right, America meets a ton! That means more than a quarter of the total time of an average American working in an organization is spent attending meetings. In 2017 Cisco reported that 37% of employee time is spent in meetings. How much of that total time spent in meetings is actually productive? According to a report by Attentiv, 63% of the total meetings held annually are conducted without an agenda. Goes without saying, ill-planned meetings lead to ill-achieved outcomes. Planning your meeting, managing it and then conducting it strategically to achieve a solid outcome from the meeting is all part of meeting management. Modern workforces have automated their traditional meeting platforms into virtual meetings, with the use of meeting management software. Meeting management software has been a tremendous help in enabling teams to achieve myriad of goals within a cost-effective approach. However, even the modern methods of conducting meetings have their downside: patchy network, technical issues and choppy video, to name a few. Which is why we have gathered a list of 6 best meeting management software that your team will most definitely enjoy meeting within. WebEx, a product of Cisco is an enterprise favorite! Known-widely for its impressive video conferencing, and webinar hosting feature, businesses of all sizes find it extremely supportive for collaborative purposes. 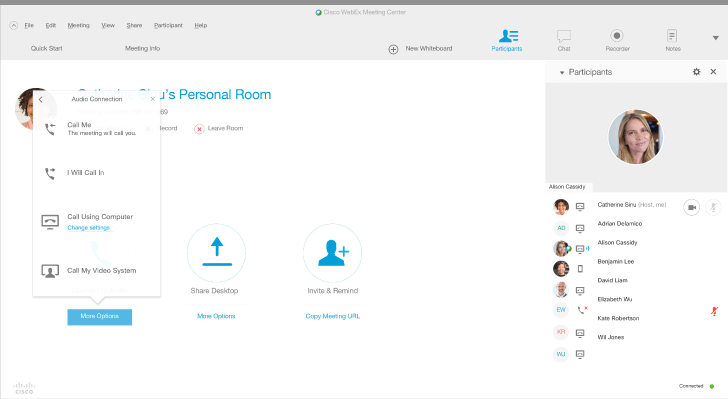 The WebEx Meeting Center is a built-in tool in the software that allows users to schedule and host meetings ahead of time. You can schedule a meeting using two set of options. If you're short on time, and all you need to do is quickly schedule a meeting with its name, attendees, date, and duration, then use the Quick Scheduler. On the contrary, you can use the Advanced Scheduler that lets you set an email reminder for the meeting and select its recurrence period. An additional reminder on the phone can also be setup using the "Call Me" feature. This will send a reminder call on your phone before the meeting is about to take place. All you need in order to invite a member to a meeting is their email address. Send easy meeting invitations from phone calls, SMS, email or IM. Cross-platform functionality that assists users to join the meeting from Mac, Windows, Linux, Solaris and any mobile device. 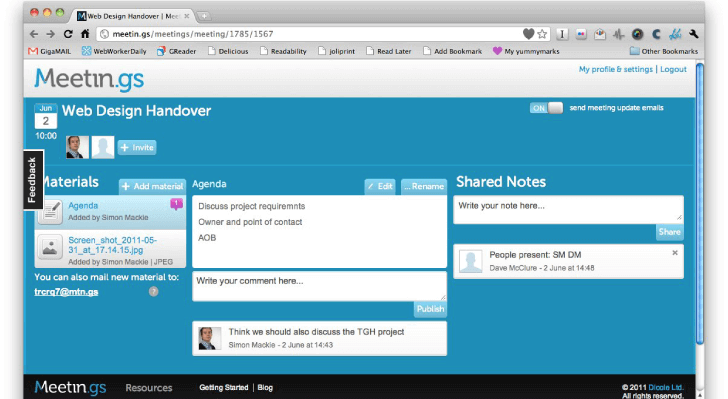 Share and edit files in a meeting, once the host of the meeting provides access to chosen attendees for making changes. Desktop integrations that allow scheduling meetings from MS-Office, Lotus, and other IMs. Meetin.gs is easily the most supportive meeting management software a team could use. It is designed to organize, streamline and align your meeting management load with an interactive interface and visually attractive notification system. There is so much that you can manage with your meetings using Meetin.gs in the simplest possible way. Meetin.gs provides numerous integrations with social communication tools (Skype, Google Hangout, Microsoft Lync, your own conferencing solution). These integrations extend out to your calendar, address book and Customer Relationship Management systems (CRM). So, you can schedule a meeting with whomever you want from anywhere, using the easy-to-use 'Schedule' button present on various services. nTask is an emerging task management software that streamlines meeting management with on-going neighboring activities like end-to-end project management, team management as well as risks and issue management. nTask is compatible with many different devices and equipment, including iOS and Android. 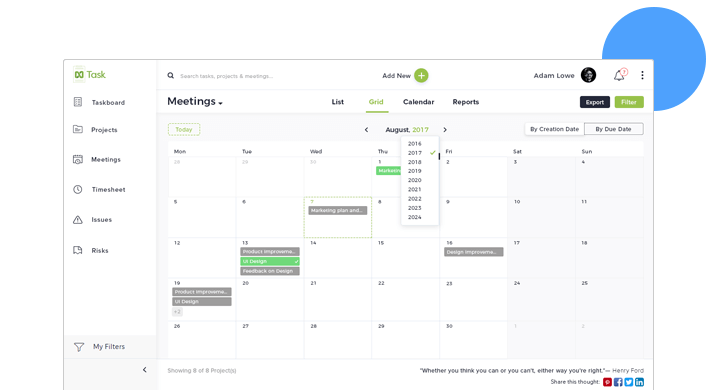 Is only a meeting management software that can be used to schedule and manage the outcomes of the meeting. Fuze is another cloud-based meeting management software that is ideal for both large and small businesses alike. It provides a stellar variety of features to modify your meeting management experience at an affordable price. 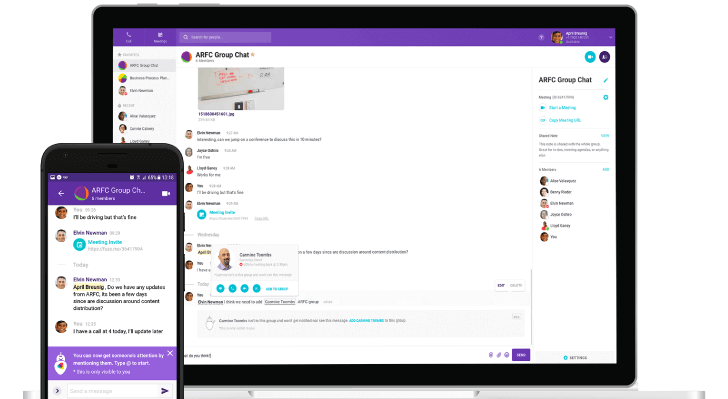 Fuze is designed to assist all sorts of business communications: video conferencing, content sharing, webinars, group chatting, and screen sharing. Enterprise Security - All meeting facets are strictly encrypted to ensure team data & information are secure. 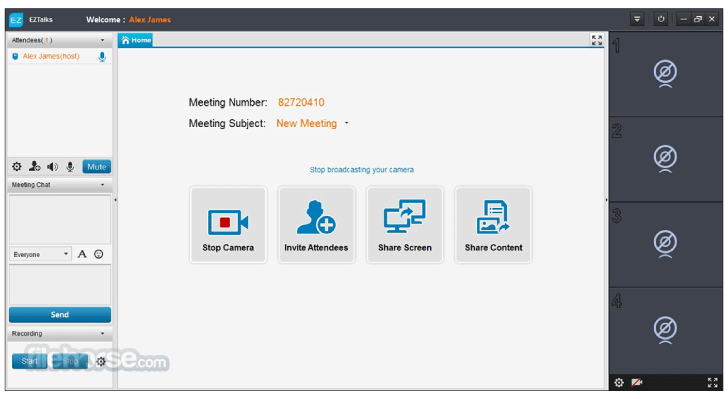 Everything you need in an ideal meeting management software, you can get it in GlobalMeet by PGi. Well, almost everything. It is one of those meeting services that were built keeping end-user functionality in mind. It enables you to enhance the quality and productivity of your meetings and how you manage them. 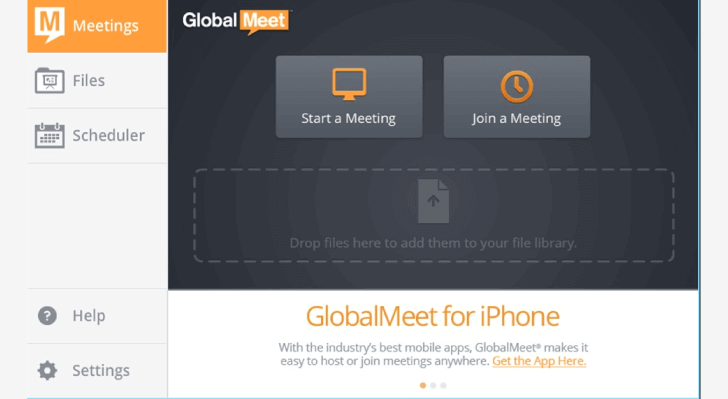 By far the most number of participants that any software can allow in a meeting is GlobalMeet. You can invite more than 120+ participants in a meeting on a paid plan. The virtual rooms in GlobalMeet are large and user-friendly, with clear panels containing big buttons for users to navigate everything on a single window. Meetings in GlobalMeet can be scheduled in two ways. One way is to use the Schedule feature on the software application. You select the date, time, duration and select your participants' email addresses. The invitation is sent to the participants via email with the URL of the meeting given in it. The software has an Outlook integration, so you can send meeting invitations from your Outlook account. All you have to do is use the GlobalMeet toolbar on your Outlook account. In GlobalMeet, there is a File Library that lets you access your files, images, documents of all sorts without having to enter the meeting. It stores all your data and information shared during a meeting. You can also move your files around in different folders by simply dragging and dropping them to the intended destination. Much like Cisco WebEx, users you can conduct surveys and polls to gather feedback from their users during or outside a meeting. Users can create MCQ questions or essay questions, and then edit or delete them whenever they want. Whiteboard feature to enable team or individual brainstorming, summarizing meeting endpoints, discussion of plans & strategies. The host can allow access to other participants to his/her own whiteboard for collaboration. Lets you transfer your meetings to another device (iOS, Android, Tablet, smartphone) without losing connectivity. Eztalks provides a comprehensive platform for teams to communicate using their HD video and audio conferencing, creative whiteboards, cross-platform integrations and real-time chatting. Eztalks aims to make meeting management and meeting assembly hassle free by providing quick access to meetings. You can send meetings invites by email or by sharing the meeting link with your attendees. The attendees don't have to register for an account in order to accept the invitation, they can simply log in using their browser and enter the meeting. Scheduling a meeting in Eztalks is equally simple. The host assigns a title to the meeting, date, time, subject of the meeting and details to let the participants know of the agenda. Allows sharing – screen sharing, whiteboard sharing, file sharing. Every meeting management software is likely to be a mixture of strong features and some poor ones. But that's ok, seeing as how every meeting has requirements unique to their purpose. Some meetings are conducted for the purpose of uniformed collaboration, some essentially for learning and some for mere feedbacks and updates. Check and see which of the meeting management software from our list fully caters to your meeting purposes and let us know in the comments below.